The spacecraft Surveyor 3 is launched from Cape Kennedy, Florida. 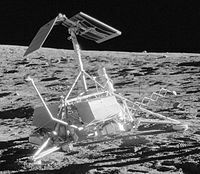 It is the second U.S. spacecraft to make a soft landing on the Moon (Surveyor 2 crash landed) where it will study the lunar surface and send more than 6,300 pictures back to Earth. In all, seven Surveyors will be sent to the Moon, five of them successfully completing soft landings.